According to College Atlas, 30 percent of college freshmen drop out after their first year, and 70 percent of Americans study at a four-year college, but less than two-thirds will earn a degree. One of the chief causes of drop-outs and poor academic performance among college students is a lack of feeling engaged or belonging, which increases feelings of loneliness and stress. Can a campus environment help combat isolation through design? How might a live/learn community on a campus of nearly 40,000 students make a difference? From the moment our team—comprised of HKS, Clark Construction, Safdie Rabines Architects and the Office of James Burnett Landscape Architects—was awarded the North Torrey Pines Living and Learning Neighborhood (NTPLLN) at UC San Diego project in February 2017, we explored issues around student health and well-being. We wanted to create a dynamic, yet warm and welcoming place for many different types of campus users: the teenager experiencing the first time away from family; faculty and administrative staff responsible for guiding students during a formative period in their lives; family members and local community members who visit the campus. We believe in designing without assumptions and making design decisions based on research and observation. Early in the design phase, we went to campus to interview students at the Sixth College, who will call NTPLLN home in the fall of 2020. We asked them which elements of their environment contributed positively and negatively to their college life. The survey results provided deep insight into the student experience and contributed to the design significantly. For all its positive attributes, the project’s design/build process made access to all user groups difficult. So, we used a persona mapping tool to understand the user experience from all points-of-view, which informed our design solution for each building type. Personas were identified and created based on their assumed daily activities, then mapped on the developing floor plans to understand where, for example, the design team might identify a place where chance meetings and interaction might occur. In June 2018, construction began on the seven building, $627 million complex on 12 acres in the heart of campus. It’s essentially a campus within a campus—the largest construction project in the university’s 57-year history at 1.6 million gross square feet. Located on UCSD’s west campus between Muir and Marshall Colleges, NTPLLN will also house the Social Sciences and Arts and Humanities buildings on the sprawling 1,200-acre oceanfront campus in La Jolla, California. From our first read-through of the university’s Detailed Program Plan (DPP), a 1,400-page document created for competing teams pursuing the design-build competition, we knew UCSD wanted something special. It outlined both the qualitative and quantitative objectives for the project, clearly establishing the university’s aspirations to create a forward-looking and inspired environment that will set new standards for future UC projects. Because the design/build competition process limits the interaction of the design team with project end-users, the university took great care to ensure the DPP included extensive stakeholder input for us to consider. 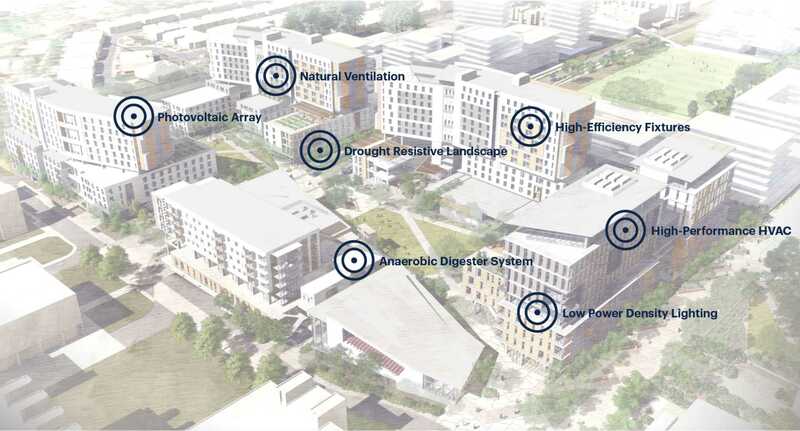 The University of California established a bold vision to create a fully integrated live/learn, mixed-use neighborhood combining 2,000 undergraduate student beds, academic buildings; faculty and administrative offices; below-grade parking and numerous amenities. NTPLLN includes a market; two-story dining hall; expansive outdoor and public spaces; retail; and the revival of the popular UCSD Craft Center, which closed in 2012. The concept behind the project is simple and dates back to 6th century Greece: students, faculty and administrators will all be more successful if their daily lives, tasks and responsibilities could be located in one place. The North Torrey Pines Living and Learning Neighborhood, the largest of its kind in the University of California system, would do just that. And while the student’s input was a critical design driver, reimagining a live/learn environment that aligns with the university’s vision and the core values was imperative. Founded in 2001, UC San Diego’s Sixth College prepares its students to become engaged 21st century citizens, offering rich and varied programs focused at the nexus of culture, art and technology. Students said it was key that their culture of innovation and creativity be included in the design in a way that respects time-honored traditions while embodying future ideals: sustainability is a crucial tenet and aligns with UC’s initiative to be carbon neutral, system-wide, by 2025. NTPLLN aspires to be a place where environmental responsibility is not only achieved in the construction but also expressed in user’s lifestyles. We’re targeting LEED Platinum certification for the entire project, which will include photovoltaic arrays powering the net-zero parking structure and an anaerobic digester that processes food waste into electricity and fertilizer. 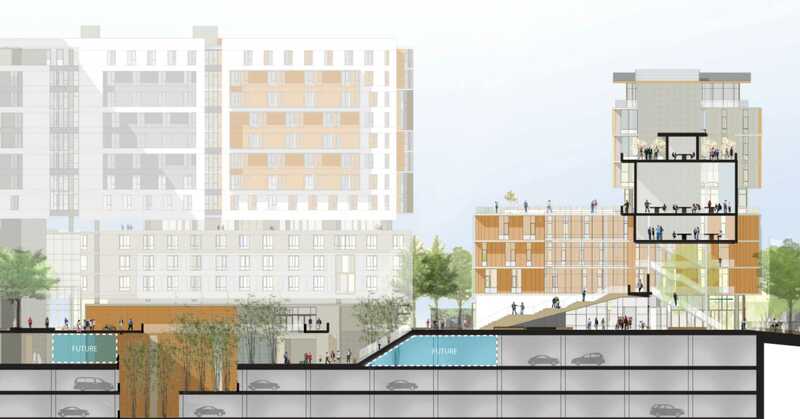 Designing to a human scale was critical due to the project’s density and a desire to create a sense of community for all who will share the neighborhood. To that end, we used the concept of nesting scales, illustrated by thinking of a student’s bedroom as their “home;” their unit, which is shared with other students, is their “neighborhood;” the floor they live on is their “community;” the campus is their “village,” and UCSD is their “city.” We kept in mind how we could design each of these scales to provide meaningful experiences. This concept is especially important for undergraduates who are likely away from home for the first time. Environments must be designed to help them in assimilating with their new surroundings to support both their academic and social success. Buildings that are more than four stories tall adjacent to pedestrian areas can feel intimidating, and we wanted the design to feel like an accessible neighborhood. Employing a dual scale design concept helped us minimize their magnitude: buildings with podiums have stepped back towers from the lower podium facades, creating places for people on the podium rooftops—called the terrace level—semi-private spaces for students and faculty to gather and enjoy access to the outdoors. The tower rooftop spaces also provide additional private meeting spaces. Breaking up the verticality in this way allowed us to create courtyards and building entry points as well. We took advantage of San Diego’s temperate climate, creating places for outdoor living throughout. To make NTPLLN feel at home with the rest of the UCSD, we continued the traditional materiality found on campus, using exposed concrete and wood in various colors. We know that learning happens anywhere on campus. The residential buildings are designed to create community, shared experiences and personal connections, with the intent to maximize encounters between students, faculty, administrators. The hope is such encounters will help everyone feel more engaged in the community. There are 15 different housing configurations in the design, providing places to accommodate and facilitate life-long learning experiences. Given the variety of options available, a student could literally have a different living arrangement every semester of their academic career. Each room is designed to feel like home and every residential building and floor is designed to provide both privacy and opportunities for social interaction. At vertical circulation nodes, there are common areas including community kitchens, living rooms and study areas as well as outdoor balconies and views. The residential buildings are almost completely naturally ventilated. The academic buildings portray the separate identities of the Social Sciences and the Arts and Humanities programs while maintaining a community with administrative staff via a shared outdoor entry plaza, courtyard, portal and roof-top decks. Situated on the high point of the site, the buildings serve as a gateway and embrace the project’s dual scales theme while providing natural daylight and fresh air. All faculty offices have operable windows. The Dean’s facilities are at the top of each building with outdoor event terraces as well as views of the entire campus and the ocean. Recognizing that the parking structure is an arrival point for many guests to the project, the design reflects the welcoming, safe and dynamic brand of the Sixth College. The design brings natural light into the garage through light wells that penetrate the entire structure. The three-story, 1,165 vehicle underground structure is designed so that some spaces can later be converted to classrooms and offices if driverless cars, biking and mass transit eventually reduce the need for parking. By breaking down traditional silos among academic, residential and administrative facilities and integrating all facets of a campus community, we anticipate our own research to mirror what we already know from students who live in these types of environments: higher GPAs and levels of campus belonging and civic engagement; shorter graduation times; fewer incidents of binge drinking and more. My hope is that the campus’ scale, complexity and openness will draw people to it. We believe it will invite residents and visitors to discover places that fit their individual personality and needs. I hope it is a place that is layered with detail and delight, where a person keeps finding things they hadn’t noticed before. This notion becomes enriched over time once the school and its users inhabit it and make it their own. My hope for this community is that it is embraced and inspires hope, ingenuity and invention and becomes a place for learning, growing and making lifelong relationships. Oh, and lots of fun. Thom Greving is an associate principal and the creative mind behind numerous award-winning projects for HKS in Los Angeles. He believes that design thinking, applied across a broad range of challenges and environments, buildings and experiences, can also address wider issues of meaning that shape our society.